Design-wise, macOS Sierra is virtually identical to its predecessor, El Capitan. In order to properly enjoy these new features it is important to have the right accompanying tools. One area that is likely to be exciting is video and in order to experience it very well, you will need a good video converter that is compatible with macOS Sierra. In fact, a raft of video converting software for macOS Sierra has some catching up to do to truly fit in on macOS Sierra. For this reason, this article will provide you with 3 of the best macOS Sierra compatible video converters in the business. 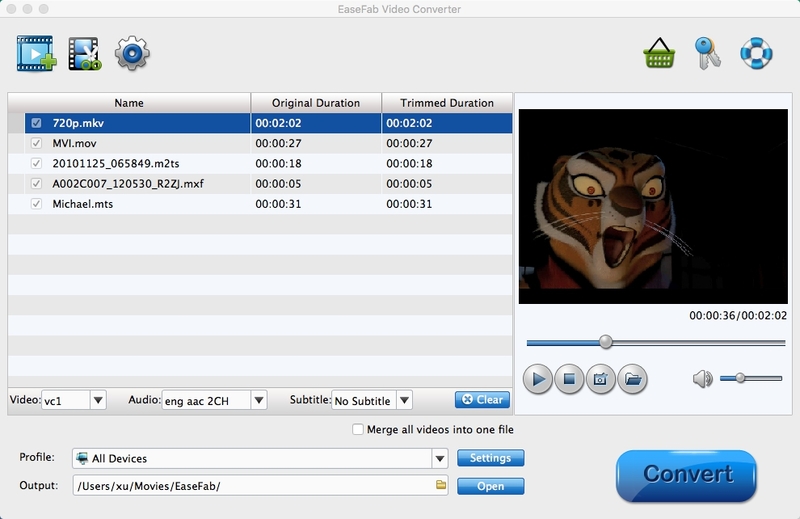 As the first Mac video converter updated to support macOS Sierra , EaseFab Video Converter for Mac is a dedicated application which focuses a lot on the idea of offering high quality video conversion from the comfort of your desktop. The main focus of this application is to help you convert files from one format to another very fast and with the utmost convenience. There are many reasons why you should choose this app. It has a 30X ultra fast conversion that will leave all competition in the dust and it also delivers support for more than 150 devices and formats. Besides, this top-ranked Video Converter for Mac supports convert all HD/4K video files including AVCHD, MTS, M2TS, XAVC, XAVC S, MXF, MOV, MP4, etc. to various professinal encoders - Apple Intermediate Codec, ProRes and DNxHD, DVCPRO, HDV, MPEG-2 - ensuring maximum editing quality and efficiency when working with iMovie, Final Cut Pro, Avid Media Composer, Adobe Premiere and more. All the video editing tools you need are integrated here so you don't have to worry if you want to edit the video before converting it. Any Video Converter allows you to convert between many popular video formats and it does offer support for many of the most important device types as well. It helps you extract audio and rip from DVD not to mention that you can download from YouTube and more as well. The ability to burn video to DVD or other formats is great and you should check that out for sure. The pros include great encoding features, very good quality and a stellar interface. The downside here is that this tool is a little expensive when compared to others in this list and the conversion process is really long. Aiseesoft Video Converter integrates a very powerful set of video conversion tools that you can use right now. It really is something reliable and professional but at the same time it does include many relevant features that you will enjoy using. It's wonderful to use and they do integrate support for the most popular video formats, it even supports 3D. The conversion process is convenient as they do support many formats and overall you do receive an amazing value for what you pay. Don't hesitate and check all these great Mac OS Sierra video tools. They are a pleasure to use and if you do want to get an amazing experience when you convert video these are definitely right up your alley!